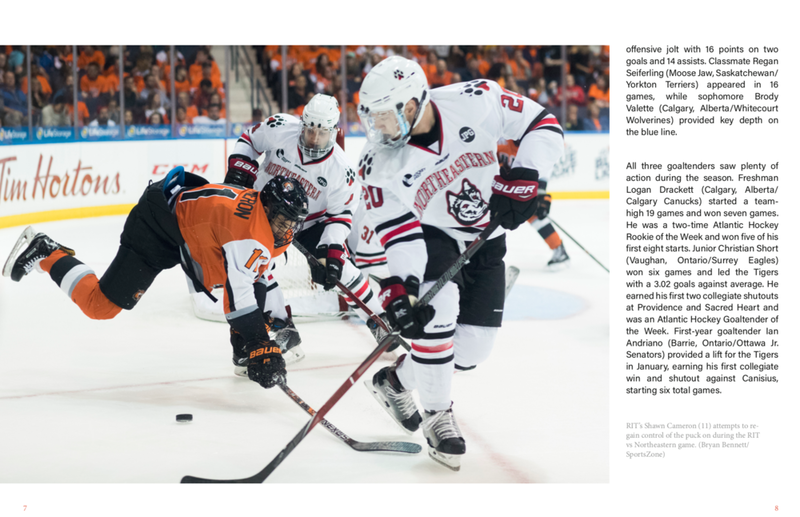 This was a self assignment I created as a way to display the best images made during the 2017-18 men's hockey season for an online magazine layout. 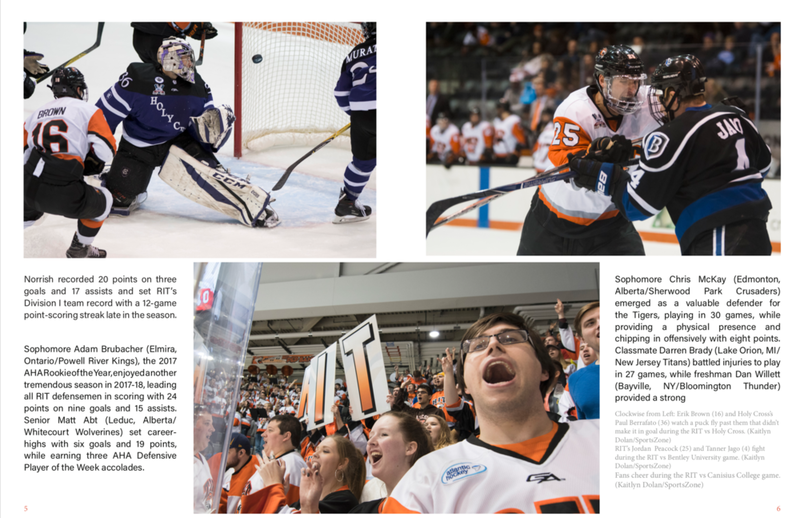 As part of my role as photo editor for RIT SportsZone I live edited the hockey games by ingesting cards, toning, uploading images to instagram and sending them to different content managers. After the hockey season ended, I went through all the men's hockey images to find the most storytelling and successful images. I knew I wanted to feature large bleed images as well as grids that highlighted an aspect of the game. For example, I knew I wanted to include images of the "Corner Crew", a corner where the most dedicated hockey fans sit. I also challenged myself to create my own layout. I looked at different design templates online and in print to get an idea of what I wanted. I pulled the colors from the first hockey images to match the orange from the jerseys. I tried to be conscious of how the images on the spread were working together and using lines to help the viewer's eye travel across the entire page. This assignment helped me to really boil down an edit to the most storytelling images. It helped that I had seen these images come through when they were shot so I knew what images I wanted to go back and grab. It also helped to do a wide edit long after my live edit because I found images during the first games that I worked that I had overlooked. I saw my own edit become stronger the more games I edited.